As mentioned in the introduction to this site, one of the biggest challenges facing any superhero comic book adaptation is how realistically to treat it — where to set the balance between the fantastic and the believable. An ideal comic book movie wants to include plenty of both, but too much of either one sabotages the other. A closely related question is how seriously a comic book tale should take itself. 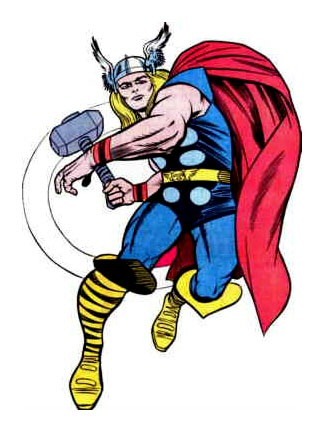 And of all comic book properties, that of Thor may be the most difficult to handle in this area. The premise is unusually tough to take seriously — especially if you assert that it exists in the same world as such entirely nonmagical superhero resources as Tony Stark’s Iron Man suit — but at the same time it cannot be treated cheekily or campily... this is real mythology and demands to be treated with respect on its own terms. Whoever directs a movie about Thor has to walk a tightrope when it comes to tone. They picked the right man for this job in Kenneth Brannagh, a man whose background is strongly Shakespearean. And when his name was announced, most fans seemed to nod with approval... “He’ll get it.” I wasn’t so sure; I remembered that this was the guy who’d cast Robert DeNiro as Frankenstein’s monster. But my worries were needless; he’s given us pretty near as good and successful a Thor movie as it would be possible to make within the Marvel canon. Since this is not really a standalone film, but is part of the shared continuity that also includes the aforementioned Iron Man, The Incredible Hulk, and the forthcoming Captain America: The First Avenger, there are a lot of constraints. There are also a lot of little easter eggs that have to be thrown in, a lot of nods to other characters and teasers for other properties that might be featured in the future. This kind of thing can easily get out of hand... it did weaken Iron Man 2 considerably. So it’s pretty remarkable that this Thor movie came out this well. How did Brannagh do it? Some of his choices were bold and surprising. For one thing, this movie has hardly any conventional superheroing. Because, you see, almost none of the heroic super action takes place on Earth. As mentioned, Thor is sent here without any of his powers, and remains a mortal man for most of his stay here. So most of the super-ing takes place in Thor’s home world, Asgard, or in the world of Jotunheim, home of Asgard’s ancient enemies, the Frost Giants. There, in a context where other beings are similarly powerful, we really do see what amounts to battles of gods, rather than superheroes. Even while Thor is on Earth, the film constantly cuts back to Asgard. Yes, Brannagh goes all out into epic fantasy. And yet he has to keep it rooted in a modern scientific reality. How does he reconcile the two? Almost nothing in the dialog addresses it — just one throwaway line about how they used to call it magic, and now the call it science, but in Asgard they are one and the same. That’s not much. It turns out that the major burden for drawing this connection falls not on the words but the imagery. And the credit for that is not all Brannagh’s... it goes back further. This is the first comic book movie that manages to look like the art of Jack Kirby. There are plenty of movies that bring to life the visions of Frank Miller and Alan Moore and Mark Millar. But in terms of influence on the comic book industry, Jack Kirby towers over them all. His art defined the Silver Age of comics, the nineteen sixties. It’s a mystery why nobody has followed up on that previously in the current comic book movie boom. But of all the times when someone could have, none would have been more perfect than this. Because one of the hallmarks of Kirby’s art was the way he fused magic and super science into a single wild vision, crackling with energy. That carries over to the film in such areas as the sky over Asgard, full of stars and nebulae in the daytime, and in the design of Asgard itself, which fuses mythological splendor with a city-of-the-future high tech sheen. Another of Kirby’s hallmarks was the over-the-top design of the costumes some of the characters wear, especially when it comes to headgear. In Asgard, this over-the-topitude is in full effect. And somehow it never looks ridiculous; merely a case of, at worst, excess formality, as might be expected in any royal court that’s as full of pomp and glamor as this is. The cityscapes of Asgard are something to see. But though the big fights are mainly off in fantasyland, the character moments are focused mainly on Earth. It is there that Thor has to learn the humility and wisdom that he needs in order to be worthy of his power. And it’s here that some of the bombast of the Asgardian sequences is moderated (and a little note of camp is allowed in) by showing the awkwardness of Thor as a fish out of water, not understanding the culture he’s now found himself in. Unfortunately... though the people involved did make some effort to have this be a movie about character, this part of the story does get somewhat short-changed. There is presumably a moment there where Thor, believing himself to be stuck permanently on Earth, decides that the right and honorable thing to do is to dedicate himself to the people of his newfound world, and if necessary, to be a warrior on their behalf as best he can. But we never see any such decision being made — the key realization, or change of attitude, occurs offscreen. And the character of Jane Foster is supposed to be expanded and deepened relative to the comic book version, by turning her from a nurse into an astrophysicist, but her character arc basically consists just of a girl who goes all giddy once she gets an eyeful of some big muscles. (Which is good fun, I suppose, until you marry the guy and then he knocks up the maid.) It’s a credit to Natalie Portman’s skill as an actrees that she makes this role one of the most believable in the film. The rest of the supporting cast is mostly fine... the standout, naturally, is Anthony Hopkins as Odin. And even the most difficult part to cast, the star, is not bad. As Thor, Chris Hemsworth has got the build, the blond hair, and the bombast. And when he tones it down, he can be charming and down-to-earth, while still carrying the undertone of arrogance. One thing that’s a little weird, relative to the comic book, is how much he smiles. Kind of reminded me of George Clooney’s ridiculous take on Batman. But it works much better here; it helps humanize a character who’s otherwise not someone you feel like you could get close to. All in all, I can’t name anyone who might have done better. The character of Loki is a bit more of a weak point. As the main nemesis in the comics, he ought to be someone who comes across as more powerful and menacing. And though they do make him a much more ambivalent character here than in the comics — as is much more in keeping with the original mythology — they don’t do so by making him a real trickster. He’s supposed to be a god of mischief, but he never once comes across as mischievous. The final aspect to discuss, I suppose, is the action. The super fightin'. It’s not bad, but unfortunately the camera work is a bit too afflicted with Bourne disease — the fashion of always keeping the point of view a little too close and a little too shaky, so you can’t quite see what’s going on. There are plenty of worse movies in this area, especially lately, but still. (Speaking of the camerawork, there are a lot of Dutch Angle shots, with rather a steep tilt to them.) But the fight scenes do give us a very nice presentation of the many different ways that Thor can use the power of his hammer, Mjolnir — whacking, throwing, spinning, flying, and so on. Everything a fan of the comic needs to see is present and accounted for. Still, a lot of it is very green-screeny. I look forward to seeing more of Thor being Thor, with Mjolnir in action, on Earth.